Table 1 lists V 2p3/2 binding energy and V 2p3/2-V 2p1/2 splitting values from a survey of literature sources compiled in the NIST Database. Table 2 presents V 2p peak fitting parameters taken from reference sample analyses. The spectra for V(IV) oxide showed a considerable amount of V(V) oxide to be present (presumable from air oxidation of the surface of the samples). 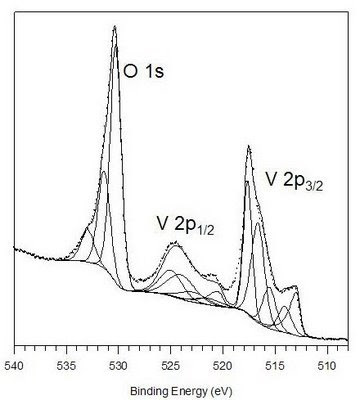 Spectra from V(III) samples were oxidized to V(IV) and V(V) species (making them unsuitable for use here) while spectra from a V(II) oxide sample showed the metal and a mix of oxide species. While peak widths for the metal and V(V) oxide are quite narrow (0.77 eV and 0.91 eV for a 10 eV pass energy, respectively), the peak widths for V(III) and V(IV) oxides are considerably broadened. This is not unexpected as multiplet splitting should be occurring for these compounds as predicted by Gupta and Sen. It does not; however, appear to resolve into specific components as seen in Gupta and Sen’s calculations. This may be clarified if suitably pure V(III) and V(IV) (and V(II)) standards can be produced. V(V) has no unpaired electrons and as such will not show any multiplet splitting. Silversmit et al. 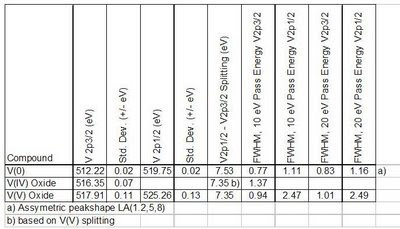 also lay out the fitting parameters for the V 2p spectra[4,5]. These results are based on spectra from a series of standard samples (V2O5 (single crystal cleaved in vacuum), VO2 (2 separately supplied powders pressed into a pellet, argon ion sputtered), and V2O3 (powder pellet, argon ion sputtered) using a Perkin-Elmer Phi ESCA 5500 equipped with a monochromatic Al Ka source. The authors give FWHM values for both V 2p3/2 and 2p1/2 for V2O3 along with the V 2p3/2 FWHM for VO2 but fail to provide values for other species. Subsequent correspondence with the author provided further FWHM details and these are provided in Table 3. 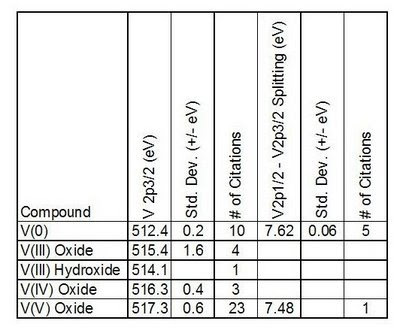 The binding energy values presented in Table 3 are charge corrected to oxygen 1s set to 530.0eV while the values in Table 2 are corrected C 1s at 284.8 eV. If the spectra from the reference samples anaylsed here are corrected to O 1s at 530.0 eV, very similar values are obtained (eg. V 2p3/2 for V(V) = 517.16 eV "0.01 eV and V(IV) = 515.6 eV "0.07 eV from this work compared to 517.2 eV and 515.8 eV for Silversmit et al., respectively). This may indicate that 530.75"0.1 eV may be a more suitable O 1s reference value (in line with C 1s at 284.8 eV) for mixed vanadium systems. Correction to oxygen only works when the bulk of the sample is a vanadium oxide. In systems where vanadium is a minor oxide component, charge correction to adventitious carbon would be a superior choice. It may also be possible to correct to the a strong V(V) peak or a well defined V(0) peak if they are present in the sample. Peak fitting parameters assembled from the three sets of data (Tables 1, 2 and 3) were used to fit this spectra from the V(II) oxide sample (Figure 1), clearly showing it is a mix of species and not pure V(II) oxide. A Shirley background extended to include the O 1s portion of the spectrum is used here and appears to give a reasonable result except for a slight “underfitting” of the 2p1/2 portion of the spectrum (i.e. some area of peak not accounted for). If a Shirley background is applied across only the V 2p portion of the spectrum a much more severe “overfit” of 2p1/2 portion of the spectrum is found. On comparison of a number of different vanadium samples it appears that the previous option is preferable, given a better fit than the latter. It may be possible using a background offset on the higher binding energy portions to further improve the fit of the 2p1/2 portion, however the improvement in quantification, based on the 2p3/2 portion of the spectrum, will be marginal at best. It should also be noted that V2O5 degrades slowly under the X-ray beam to V(IV) compounds. Using a 210 W source (15 mA, 14 kV) and a timed set of scans, upwards of 8 to 10% conversion of V(V) to V(IV) was found. This should also be taken into account during any analysis of vanadium compounds . Expanded discussion on this work is found in reference . A CasaXPS ready example of multiple vanadium species can be found at the link. Figure 1. V 2p (and O 1s) spectrum of a mixed vanadium oxide sample . Table 1. Literature values (from ) for V 2p3/2 spectra. Table 2. 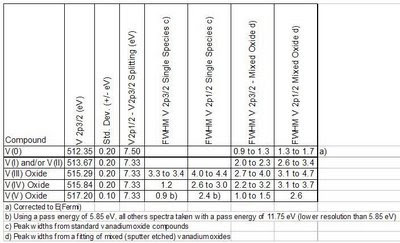 Spectral fitting parameters for V 2p: binding energy (eV), percentage of total area, FWHM value (eV) for each pass energy, and spectral component separation (eV) . Table 3. Spectral fitting parameters for V 2p: binding energy (eV), percentage of total area, FWHM value (eV) for each pass energy, and spectral component separation (eV) from references . Binding energy values are corrected to oxygen 1s set to 530.0eV. Silversmit, G, Depla, D, Poelman, H, Marin, GB & De Gryse, R 2004, ‘Determination of V2p XPS binding energies for different vanadium oxidation states (V5+ to V0+)’, Journal of Electron Spectroscopy and Related Phenomena, vol. 135, pp.167-175. Silversmit, G, Depla, D, Poelman, H, Marin, GB & De Gryse, R 2006, ‘An XPS study on the surface reduction of V2O5(001) induced by Ar+ ion bombardment’, Surface Science, vol. 600, pp.3512-3517.